Our cottage has 2 bedrooms and 1 bath with double sink. One bedroom has king bed, 2nd bedroom has two twin beds. Kitchen fully equipped. Washer/Dryer, wireless internet, TV with built in DVD Apple TV with Netflix. Looking for more space for larger group in winter, our front house vrbo 1479537 is available. We have been owners since 2005. We truly enjoy living downtown Ashland so close to theaters, and all the downtown activities. The best location in town, easy stroll to town and theaters. Great off street parking. Beautiful private courtyard with comfy seating. Spacious comfortable one level 1100 sq ft home. Large private outdoor courtyard fully furnished for dining or just relaxing by outdoor fountain. Favorite activity for most of our guests on a cool evening is sitting on sofas around firepit enjoying a glass of wine or favorite drink. I don't know if I've ever stayed in a vacation rental in which the owner has been as thoughtful in making sure everything would be so perfect for our comfort. And the location couldn't be better. I can't think of think of anything that Stacy could have done better. Thank you for a wonderful time! We really enjoyed our four days at this spotless and charming home in Ashland over the holidays. The fully stocked kitchen and open kitchen-dining-living room layout was perfect for spending time with family and cooking together. The home is extremely dark and quiet at night, and we loved spending time in the courtyard and hot tub in the evenings. The short walk to town and the co-op make it incredibly easy to enjoy good food. Thank you for everything Stacy! We really enjoyed staying in the cottage, it was quiet, very comfortable, and convienant for all activites in Ashland. 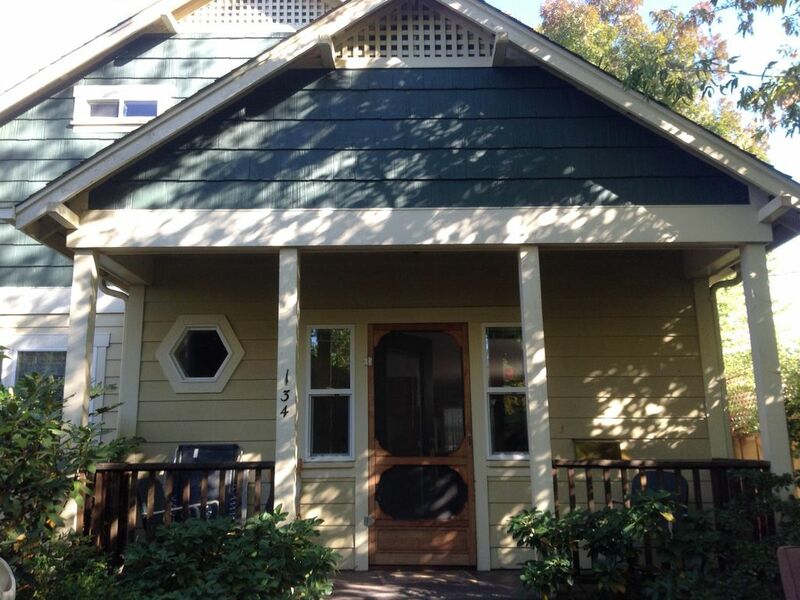 Stacy's cottage is tucked away in a quiet area of Ashland, situated in it's own little piece of heaven. It's an oasis from the hot days with a comfy house, porch and patio to enjoy. The decor is eclectic with a mix of modern and old and adds to the charm of the cottage. The kitchen is well equiped and the place is spotless. We are used to a lot of house "rules" in VRBO's and a long list of what we need to do when it is time to leave, but not here. A simple load the towels in the clothes washer and that's it! I always like to leave things tidy, though, so did a bit more. If I were to get picky, I would say that a few more smaller serving bowls would have been welcome, but the kitchen has a lot of appliances from the hot water pot to a stick blender. Measuring cups and spoons brought a smile to my face too. While we ate many meals out, we did do a bit of occasional cooking and were able to find what we needed, even some common things likes spices that you need just a pinch of in your favorite recipe. We looked forward to meeting Stacy, but alas, she had a very busy week and that didn't happen. Her mother, Ina, was a delight and I enjoyed my conversations with her as we were leaving the patio for a play or a meal. The large rooms in the cottage gave us plenty of spread out room and the king bed was very comfy. There are twin beds in the other bedroom. Lots of hangers for clothes in both closets. If you are a TV addict, there are just a few channels available on the tv, but there is Netflix included if you are craving a TV fix. We travel to Ashland each year for OSF and will hope that this cottage is available on our next adventure. Perfect for our 4-women Ashland getaway! Really good location, within short walking distance of downtown Ashland shopping, restaurants, and Oregon Shakespeare Festival. Our "own" cottage was very clean, tastefully furnished, quality art on the walls, and complete kitchen with good appliances -- plus courtyard with nice outdoor seating and tables and hot tub (spa). Quiet location, very little street or neighborhood noise. Convenient (reserved) parking. We will definitely choose Stacy's Second Street Cottages for our next visit to Ashland! Everything as advertised... although not exactly two blocks to plays, more like 5 minute walk... very close. Pleasant quiet place, full kitchen, air conditioning, and nice water fountain outside the bedroom window. Unfortunately several nights with air quality issues—that’s a problem with living in such a lovely spot, surrounded by forests. By that I mean Ashland and Oregon. Will stay again, I hope!